November is almost over and you know what that means? Exactly, NaNoWriMo is also over, which is very sad because it was a lot of fun but I have really good news for you guys: I made it! I finished my entire second book for the Hunting Freedom-Trilogy throughout the past 30 days - 61.619 words in total. 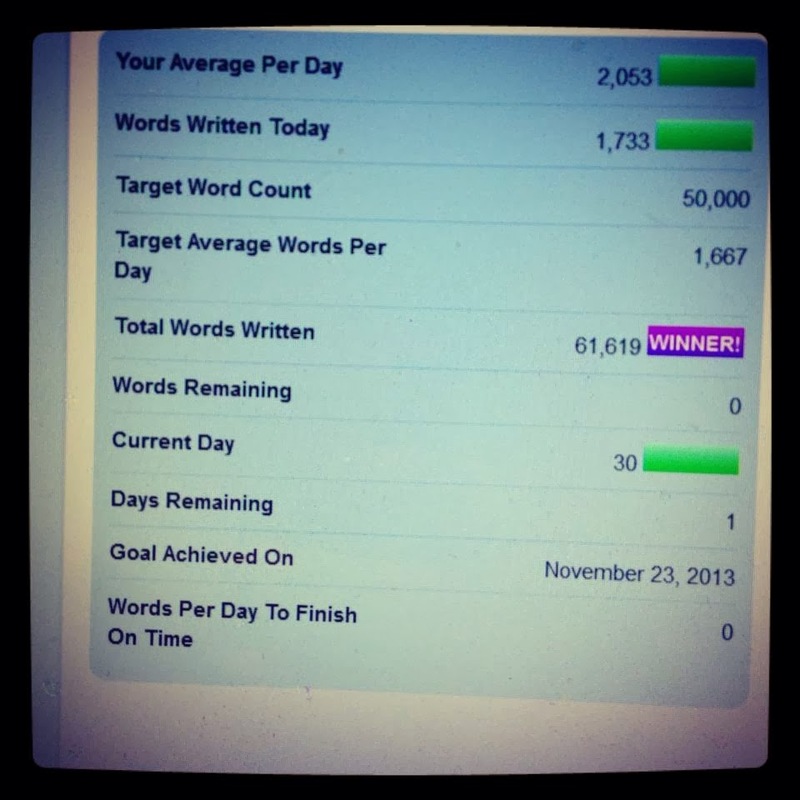 I reached the magical 50.000 words line on the 23.11.13 but I waited with validating my novel till yesterday night. Personally I think NaNoWriMo was a great experience and a great motivation to really sit down every evening after school and write, at least a bit, even on really busy days. I even tried to attend a NaNoWriMo meeting in my city but unfortunately no one besides me showed up, which was disappointing but okay. 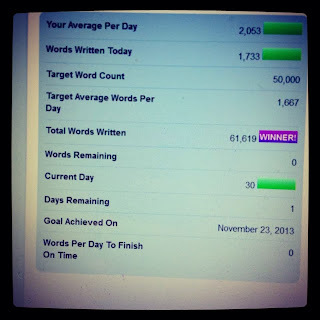 When I first came up with the idea of participating I didn't really think I would make it, I thought that writing 50.000 words in 30 days is something almost impossible as I didn't think I would have enough determination to really focus on writing and really pull through. Now, after everything is over I am really happy that I have proven myself wrong and actually made it. A lot of my friends or classmates were totally shocked as to how I have to time and the imagination to write an entire novel in just one month, and really, I have no idea. I guess it has a lot to do with preparation. Before NaNoWriMo started I made a plan as to what would happen when, who would interact with whom when and where. Of course while writing I added a few things here and there or changed things that I didn't like that much after all, but that’s normal. Throughout December the editing process awaits me, reading the whole thing, adding/changing/deleting things that I don't like and many more. It's going to be a lot of work but I'm still looking forward to it. I also already have a title for the novel, which I'm not going to reveal just yet. Just before I say goodbye I have a question for you guys: I know that a lot of people like all this social media interaction so I was wondering what you guys think about the idea of me setting up a instagram profile so we can get more in touch and such?